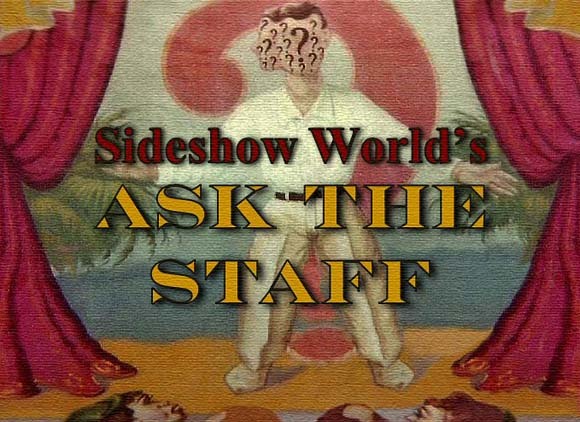 Looking for answers to your questions about sideshow history? Have some questions about shows or performers from the past? You've come to the right place! Using the form at the bottom of this page you can send in your questions and one of our staff members will do our best to research it, provide you with an answer and possibly publish it on our site! What Do You Know About Koo-Koo Franks?? Do You Know Whose Show this Was? Tobacco Road - Banner by ? So� Say that it's 1939 and I am a sideshow performer? Little Harvey and His Bull Elmer? Girl 2 Gorilla Set Up? Is this Celesta Geyer aka Dolly Dimples? Could this be Frances O�Connor? Life Among Lizards Not Always Rosy! This section is not for questions regarding information on how to perform acts, where to learn acts, etc. It is designed for historical style questions only. All other questions will be disregarded. A name (or alias), state and town is required for your question to be considered.